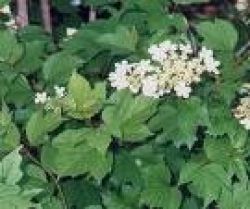 Crampbark plant, Viburnum opulus, is also known as Guelder Rose. A tincture or tea of the dried bark effectively alleviates menstrual cramps and arthritis. An attractive shrub, sometimes mistakenly called “Cranberry”. Note: The fresh raw berries are toxic, but become edible after cooking. Crampbark plant is native to Europe, North Africa and north Asia and is adaptable to most soils, but prefers an open, sunny position. White flowers in large clusters appear in early summer. Frost resistant but drought tender. A deciduous shrub, growing to 3m x 2m. Be the first to review “Crampbark, plant” Click here to cancel reply.